Top o' da mornin' to ya! 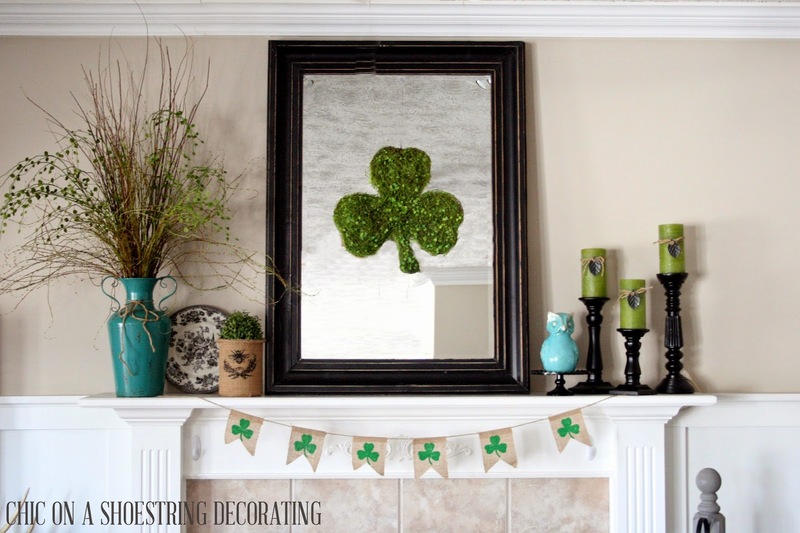 As someone with a lot of Irish blood, I am a little bit ashamed to admit that I have skipped right over my heritages' most important holiday when it comes to decorating. I mean, I didn't even acknowledge it in my decor at all. I just jumped straight to the whole Spring/Easter motif in past years. I skipped St. Patty's Day not out of disrespect but simply because most of the pre-made St. Patrick's Day decor is terribly cheesy. It's all rainbows, pots of fake gold, glittery shamrocks and green beer (does green beer count as decor?). Anyway, pure cheesy-ness. Take note, there is not much "official" St. Patty's Day stuff going on here but it still looks pretty St. Patrick's Day-ish don't you think? 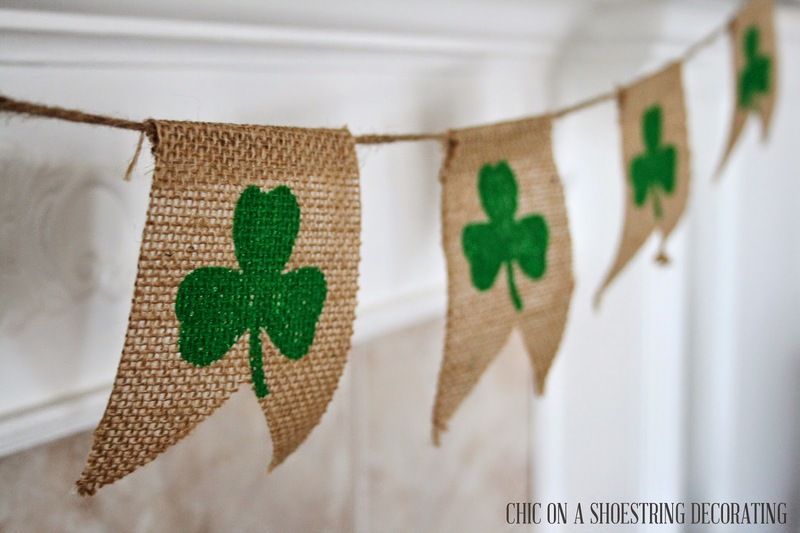 I got this non-glittery and very cute shamrock burlap banner from the Hob Lob on sale for around $6 bucks. I know the die-hard crafters out there are going to say I could've made it myself. Yes, but it would've been more than $6 bucks for materials plus my time and my time is SO worth more than $6 bucks. Sometimes it is just better to buy. Here's another view where you can see my pillows sticking out. 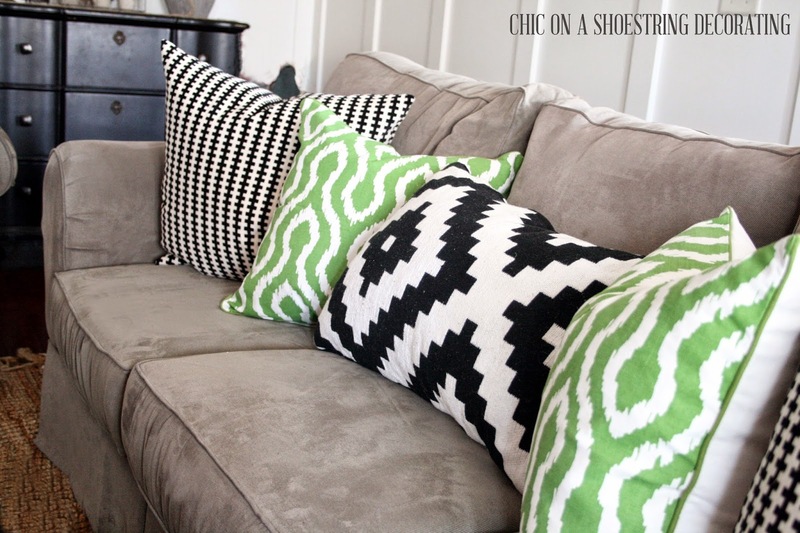 I added some green pillows to my black and white Ikea pillow collection. They say St. Patrick's Day without saying "CHEEEEEEESY", right ? 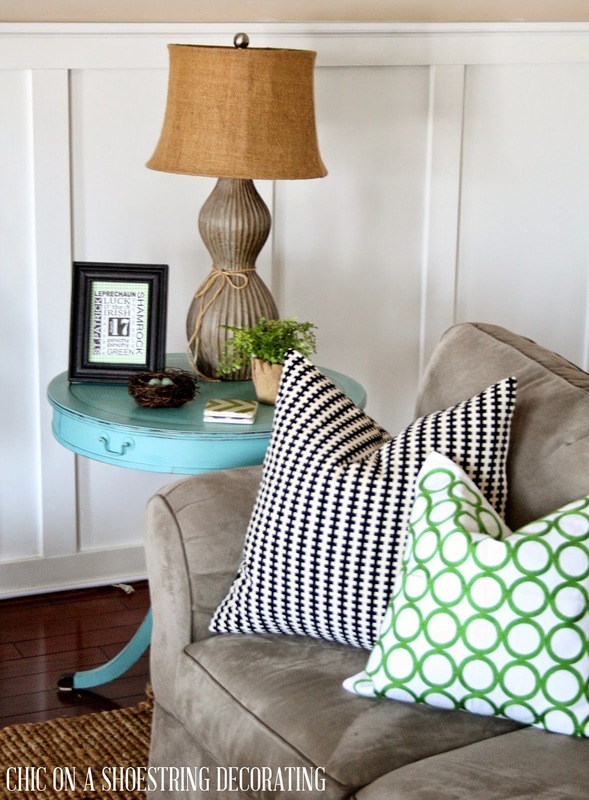 I added a different green pillow on the love seat just to mix it up a bit. I downloaded a free printable from someone a long time ago (found here) but had all kinds of trouble printing it in color so I ended up printing it in black and white and sticking it to some green gingham scrapbook paper. Not fancy but no one notices and it works. I picked up this glittery (GASP!) shamrock a few years back when I thought I would attempt some St. Patty's decorating. It is borderline cheesy BUT, I put a cloche with a rope on it and now it is super fancy! 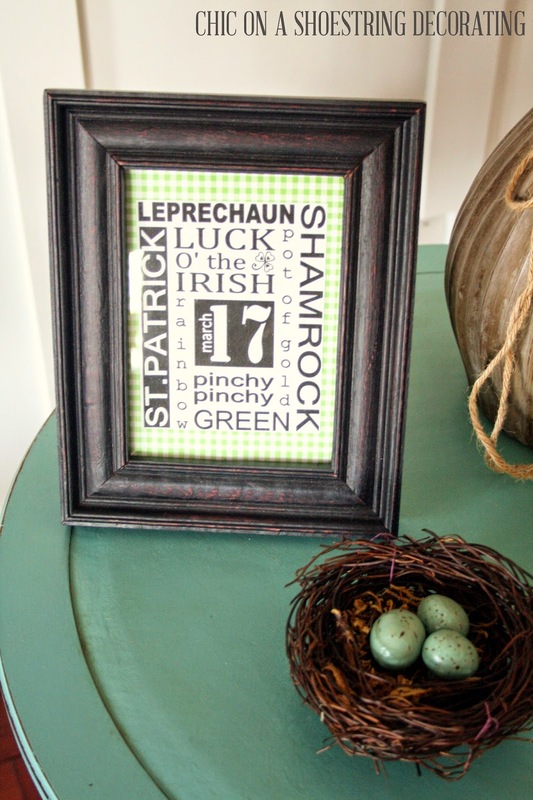 So, here are my tips for decorating for St. Patrick's Day minus the cheese factor. 1. Don't use a lot of St. Patrick's Day specific decor. 3. 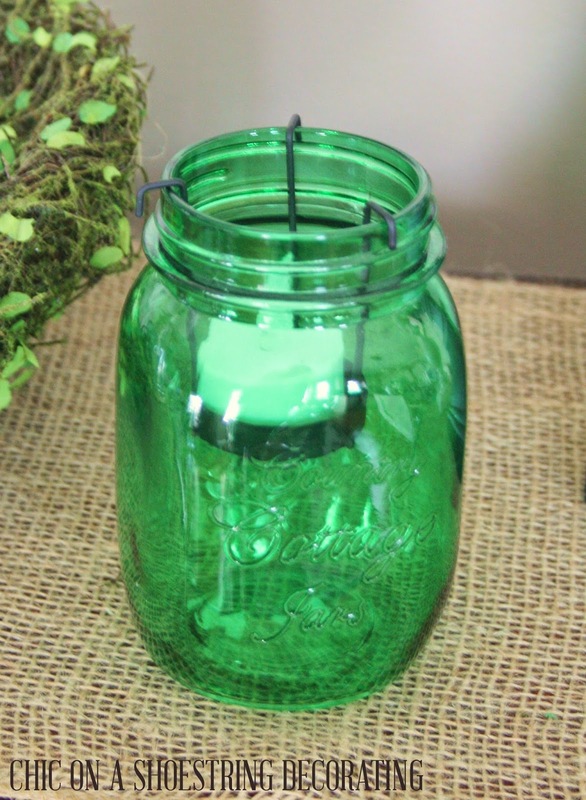 Use green stuff you've already got around the house, candles, pillows, even greenery like plants, vines or stems. 5. 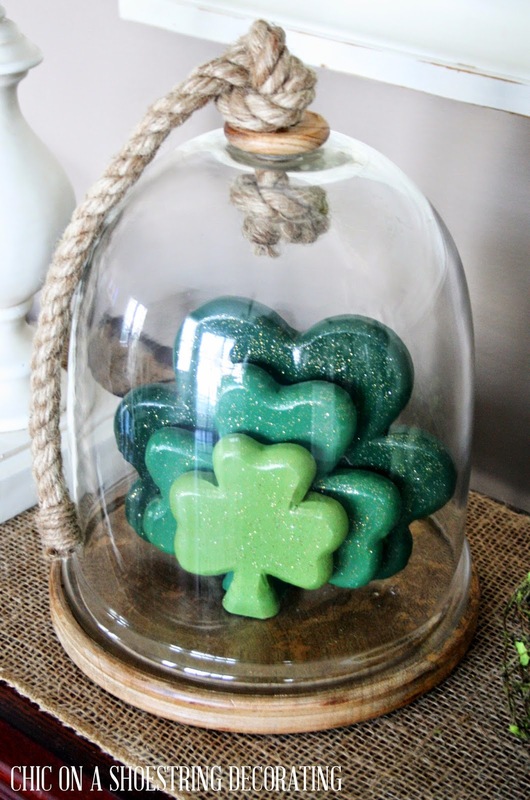 If you have a glittery shamrock put a cloche over it. 6. Green Beer should not count as decor but should be enjoyed (responsibly) on St. Patty's Day. So there you have it. 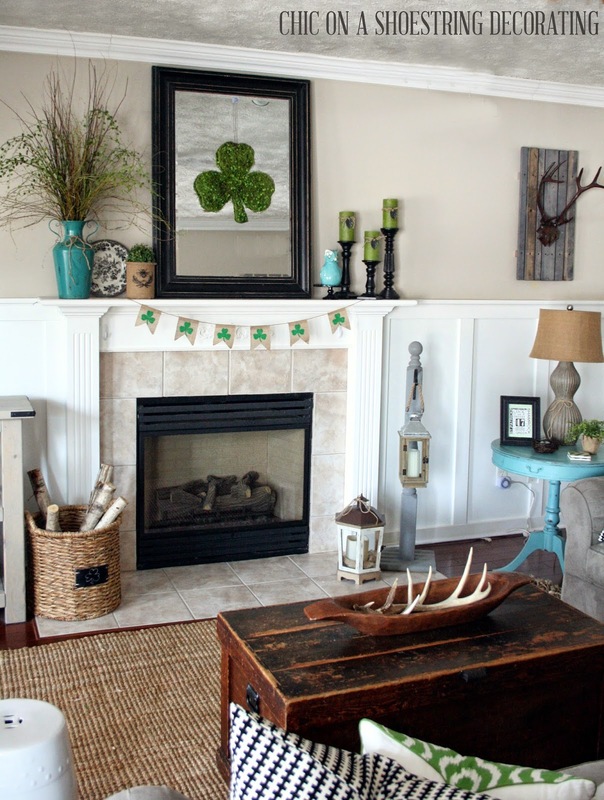 My easy St. Patrick's Day decor ideas. Just put a little thought into reusing things you already own and you can represent this fun Irish holiday without feeling like a cheeseball. 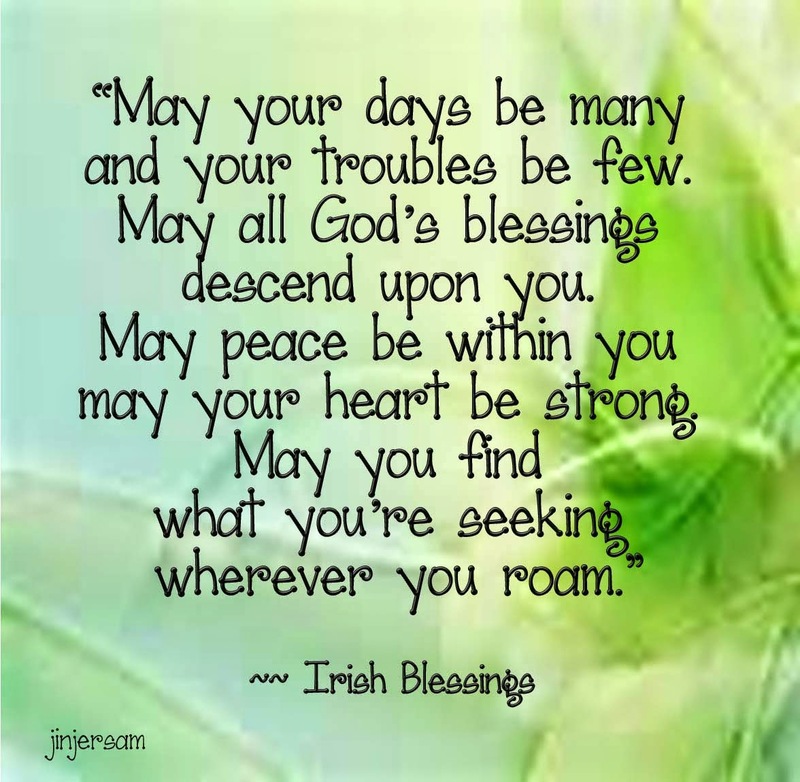 And now, I leave you with an old Irish blessing. If you'd like to see my past attempts at St. Patrick's Day decorating you can see them here and here. Happy St. Patrick's Day friends!